This mini-series will look at Pokemon who have the potential to make a big impact at the 2018 World Championships. The next article looks at Tyranitar, including its Mega Evolution and why they both have the potential to perform big at the 2018 World Championships. Historically, Tyranitar has always been one of the most popular Pokemon in VGC in every format its allowed barring the VGC 2016 season. One of the big reasons is Tyranitar's Rock/Dark typing which is especially useful as the Dark typing gives it an immunity to Prankster as well Psychic type moves from Pokemon like Tapu Lele, Cresselia, and Metagross. The Rock typing makes it strong versus Pokemon like Charizard, Zapdos, and Incineroar. It's main ability to see on Tyranitar is Sand Stream. While Tyranitar does get access to Unnerve, there are simply better Pokemon that get this ability such as Aerodactyl, Houndoom, and Galvantula. Being able to set Sand is very helpful for Tyranitar since it gains a Sp. Defense increase as a part Rock type, which can allow Tyranitar to survive powerful special attacking moves. Unnerve can be a cool ability for Tyranitar since berries are probably the most common items in VGC outside of Z-Crystals and Mega Stones, but Sand Stream is such a helpful ability that its hard to justify not running Sand Stream in a format dominated by weather abilities like Drought and Drizzle. Tyranitar's Rock/Dark typing can make it very useful. Tyranitar is able to threaten Charizard, Metagross, Salamence, and Gengar which are 4 of the most common Mega Evolutions in the 2018 format. Kangaskhan can threaten with super-effective Fighting type moves which is an issue, but Tyranitar can be trained to survive those moves which is helpful. The first sample set is for a Mega Tyranitar. The idea is to take advantage of your impressive base 164 attack stat to try and dish out as much damage as possible. Rock Slide and Crunch are its 2 most popular attacks as they take advantage of that large attack stat and the STAB power bonus. Should Mega Tyranitar's attack stat be hindered, you have Dragon Dance to increase your both your damage output and improve your base 71 Speed stat. The EV spread for this Mega Tyranitar gives it a 15/16 chance to survive Jolly Kartana's Sacred Sword and under Tailwind, Tyranitar can out-speed base 130 Pokemon such as Timid Tapu Koko and Timid Mega Gengar, but can also outspeed Lonely nature Pheromosa under Tailwind as well. There isn't to much more to say for this Mega Tyranitar. 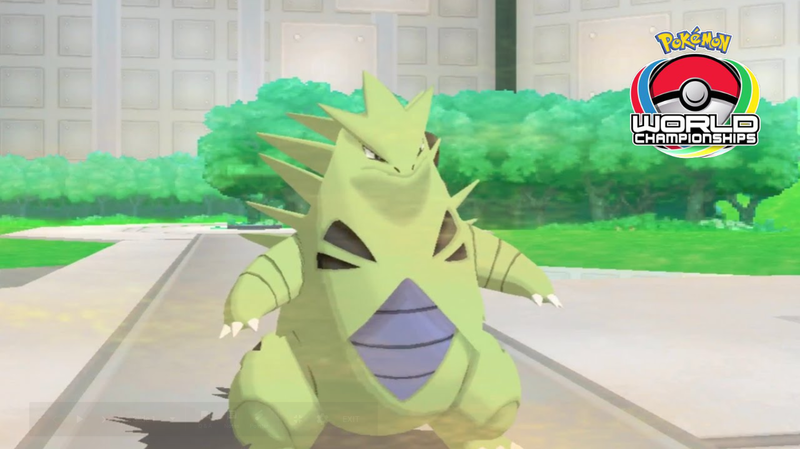 Its goal is to deal as much as damage as possible and try to stay a big offensive threat which is why if you see a Mega Tyranitar in battle, always be prepared that Dragon Dance may be incoming. This Tyranitar takes advantages of the fact that Tyranitar is weak to 7 different types, which this Tyranitar is counting on its going to be hit by one of those 7 super-effective types, which is going to activate its Weakness Policy and gain the +2 in Attack and Sp. Attack. The EV Spread was created by Jake Muller (@MajorBowman_) who used it to finish Top 16 at the 2018 North American Internationals, which allows this Tyranitar to outspeed Mega Salamence under Tailwind and gives it a 62.5% chance to survive Jolly Mega Metagross' Iron Head while still having an HP stat of 189 which works with Life Orb. The moves are very simple. Rock Slide and Crunch are very standard, safe, and reliable moves to use on Tyranitar. At the event, Jake used Foul Play which he noted that with the Life Orb, can KO very bulky Mega Metagross whose attack stat isn't hindered while also being able to threaten Landorus-Therian and even Snorlax which means this Tyranitar can threaten both Belly Drum and Curse variants of Snorlax. He noted that Low Kick is another viable option for Tyranitar but Foul Play was more helpful for him, the event, and possibly the team as a whole. This Tyranitar build was originally built by Ben Grissmer (@gimmerVGC) who used it very early in the VGC 2018 season to finish Top 4 in the win-a-trip challenge to 2018 Oceania Internationals. Ben notes that the big strength of this Tyranitar is being able to OHKO both Cresselia and Aegislash with your Z-Move, which is great for Tyranitar because it allows for it to threaten a lot of damage on bulkier Pokemon. The EV spread for this Tyranitar allows it to outspeed Tapu Koko and Mega Gengar under Tailwind and has a 43.8% chance to survive Jolly Mega Metagross' Iron Head. Ben notes that for the moves, Rock Slide and Crunch are safe options and Low Kick over something like Ice Punch or Dragon Dance because his team lacked a Fighting type move, but Ice Punch and Dragon Dance are both great options on Tyranitar if you want to run them. Assault Vest is a very cool item. The Sp. Defense boost Tyranitar gets from the vest is like the boost it gets under the Sun. A very interesting damage calc that shows the strength of Assault Vest is how Ludicolo's Hydro Vortex based on Hydro Pump only does 69.7 – 83.4% to no bulk Tyranitar simply because it holds the Assault Vest. Weakness Policy takes advantage of how Tyranitar is weak to 7 types, including common types such as Water, Grass, and Fairy to gain +2 in both Attack and Sp. Attack. Because Tyranitar is weak to types that are present on most teams, it's almost certain you'll receive the benefits due to how Tyranitar is weak to common types as said above. With the Choice Scarf, it allows Tyranitar to outspeed Pokemon it otherwise wouldn't to try and get off some big damage. For example, a max speed Tyranitar with a Jolly nature will hit a 186 Speed stat which is slower than max speed Mega Salamence. The extra speed can allow Tyranitar to pick up KOs it otherwise might not, such as KO'ing Landorus with Ice Punch because without the Choice Scarf, Tyranitar would have to survive a hit from Landorus to do this. Amoonguss gives Tyranitar something it really wants, the ability to safely use Dragon Dance. Amoonguss can use Rage Powder to redirect the moves Tyranitar doesn't want to deal with as its Grass/Poison tying perfectly switches into the types Tyranitar is weak to. This can allow Tyranitar to safely setup to become an offensive threat. Excadrill works thanks to its Sand Rush ability which combos very well with Tyranitar since it can allow Excadrill to outspeed Pokemon it normally wouldn't. This duo can be seen clicking Rock Slide repeatedly to try and get flinches or having Excadrill go for a big KO Tyranitar may struggle with. Either or, the strength of this duo is how good it as at picking up easy knockouts. Cresselia's access to a lot of very useful support moves can help Tyranitar do its job. Moves like Helping Hand, Icy Wind, Skill Swap, Ally Switch, and Trick Room are just some of the moves Cresselia can use to help support Tyranitar. If there's one type Tyranitar fears the most, its Fighting type moves and Scrafty, Kartana, and Terrakion are the most dangerous user of these moves. Scrafty brings Intimidate to weaken Tyranitar power, Kartana's strong physical bulk can allow it to tank it's moves and has the added bonus of super-effective damage thanks to its Grass and Steel type moves, and Terrakion's Justified ability makes it so Dark type moves are useless without raising its attack stat. Fighting type moves are also very common coverage moves as Pokemon like Kangaskhan and Landorus-Therian have a chance of having one. Tyranitar also doesn't enjoy dealing with Fairy type moves. Tapu Lele and Mega Gardevoir both fear Crunch thanks to being part Psychic types, but what all 4 of these Pokemon do well is access to strong Fairy type moves like Moonblast from the Tapus, Hyper Voice from Gardevoir, and Play Rough from Azumarill. Azumarill and Tapu Fini are also able to deal super-effective damage thanks to their Water type moves. If Tyranitar losses control of the weather to Rain teams, it can get very scary. Politoed and Pelipper can set the Rain for a Pokemon like Ludicolo or Mega Swampert to fire off Rain boosted Water type moves. Politoed's impressive bulk can allow it to tank hits for a chance at a Scald burn and while Pelipper can also try for Scald burns, its weakness to Rock type moves is something to worry about. Tyranitar hates dealing with Steel types moves and these 4 Pokemon are the most popular Steel type move users. Mega Metagross threatens with a Tough Claws boosted Iron Head which as shown in the sample sets, only a bulky Tyranitar can be trained to survive it and it's not even guaranteed in all sets except Mega Tyranitar. Ferrothorn can threaten with Gyro Ball which punishes a Dragon Dance, Celesteela threatens with Heavy Slam due to its increased weight, and Aegislash can use Flash Cannon but it does have to worry about a super-effective Crunch or Foul Play. In short, Tyranitar's strengths are going to be how well it can handle the current format. Popular Pokemon like Incineroar, Metagross, and Charizard all struggle to deal with Tyranitar which can make it a very strong surprise pick for teams. And if it means anything, 2018 North American International Champion, Jeremy Rodrigues (@SerapisVGC) has recently said in an interview on TheGameHaus that he's a firm believer in Tyranitar's shot at a really strong performance at the World Championships. The EV spread on Set #1 has enough speed to outspeed + speed base 130s unter tailwind, not dragon dance it requires 244 evs jolly to do that with a dragon dance.